This beautiful and unique plate is full of Spanish soul and features a colourful flower pattern in a blaze of rich, vibrant colours, individually handpainted in Andalucía, in the south of the country. This is a land of Moorish arches alongside Catholic towers, with white villages scattered across verdant hills and dry and dusty valleys. There is an intoxicating charm about this area that even the high-rise hotels of modern tourism cannot take away. 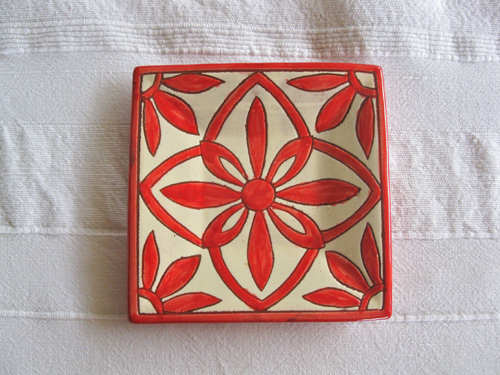 The plate is made from the local clay of the area and has a lovely rustic quality. What a fantastic gift to give a friend or loved-one to take pride of place on their table or wall. Detail: The plate measures 13.5cm square and there is a hole on the back for hanging. This Daisy plate would make a great present to pass on your best wishes particularly for a house warming gift - to cheer up a new home. Comes gift-wrapped, like all our presents - and we can print a personal message on your behalf.